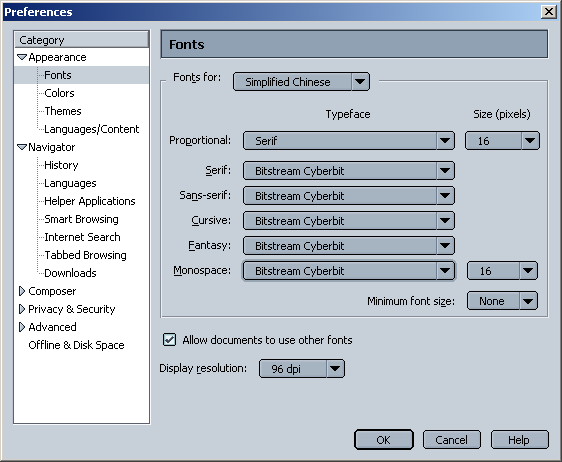 Both Netscape 7.0 and Mozilla 0.9.x find suitable fonts automatically. 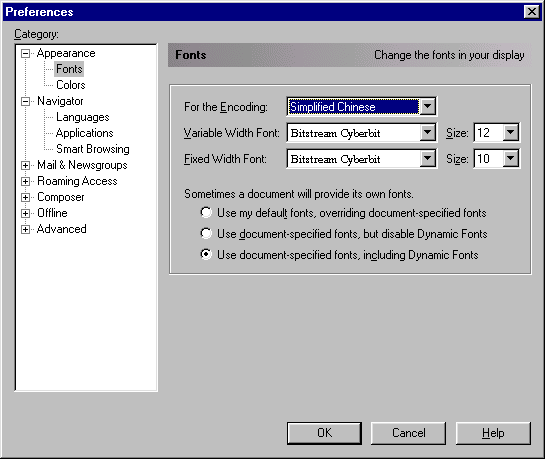 One can, however, fine-tune font settings pretty much like in Netscape Communicator 4.7 described below. Don't try to do all these steps at once without hitting OK! 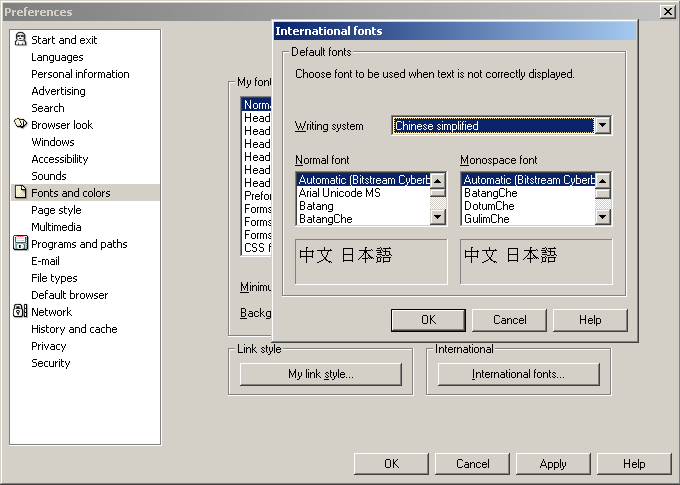 K-Meleon finds the font automatically, but it needs needs a separate language pack to be installed. I haven't figured out how to change these settings. Sorry, Amaya cannot be configured to view multiple languages. All-In-One Page CEDICT Chinese-English Dictionaries in Simplified Chinese and in Traditional Chinese. 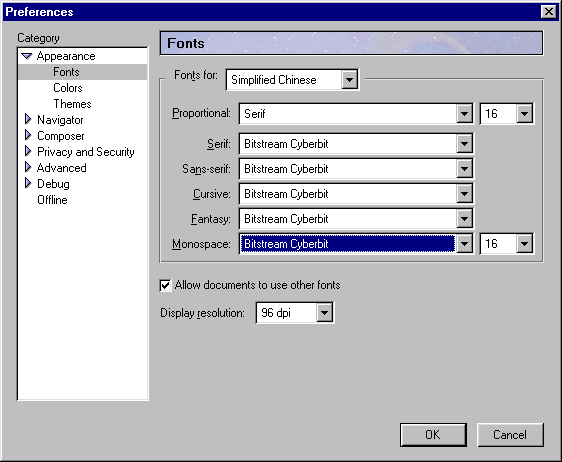 Users of older Windows systems (95 and 98) are also advised to update their core fonts if there are troubles with certain Pinyin characters. It is probably necessary to make Chinese characters to appear slightly bigger than latin characters. This can be done permanently, defining a bigger font size in the font configuration explained above, or temporarily using browser's features. In Netscape the font size can be temporarily increased using View -> Increase Font, and in Mozilla with View -> Text Size ->. To make it easier to choose the most appealing font, there is a small review of GB fonts mentioned above in HTML and PDF format. 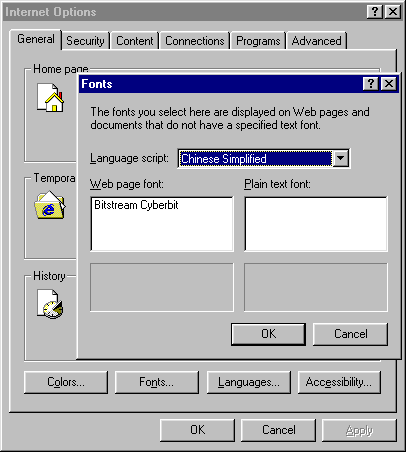 There is also a separate document dealing with some issues related to publishing web pages in Chinese. If some characters are missing from the printed output, please take a look at Printing Chinese web pages document. I need your feedback to keep this page up-to-date. Please send me email if you find inaccuracies or outdated information from this page.